In 2002, my research colleagues and I published a paper in the Journal of Fluorine Chemistry that talked about our modification of the ligand that was used to create perfluoroalkyl rhenium(I) complexes, which would ultimately be used to reduce carbon dioxide to carbon monoxide in a fluorous biphasic system. Stay with me! By the time you finish reading this post, you’ll completely understand that first sentence. Promise. The difference is that, in a homogeneous environment, the catalysts become soluble in the solvent to form one phase along with the reactants, while in a heterogeneous environment, the catalyst doesn’t become soluble and so stays in the solvent in its own phase. If I’ve already lost you, let me simplify. It’s really just as easy as the difference between tea and coffee. Adding sugar to coffee is a homogenous mixture, because the sugar (catalyst) mixes with the coffee (solvent) to be one single environment, i.e., a homogeneous environment. When you brew tea leaves in hot water, the leaves don’t dissolve, unlike the sugar in the coffee. There are still two phases: the water (now tea) and the leaves themselves. That’s a heterogeneous environment. It’s lucky for our taste buds that sugar dissolves so easily in coffee. But in the world of chemistry, sometimes we want to get two substances to combine, but they won’t play nice. So we have to modify one or both in some way. A longstanding problem in chemistry has been how to get the activities and mild reaction conditions that are typically associated with homogeneous catalysts while simultaneously getting the separation properties that are afforded by heterogeneous catalysts. In 1994, István Horváth and Jószef Rábai published a study in Science about a fluorous biphasic system, which is a system with two phases: a fluorous solvent and a hydrocarbon solvent. If your fluorous solvent has too much fluorine, it won’t be soluble in the hydrocarbon solvent. But if you take a mixture of a fluorous solvent and a hydrocarbon solvent, they will actually form two layers (phases), like oil and vinegar. However, if you were to heat up the mixture, it would actually combine into one phase, where the fluorous phase would actually dissolve into the hydrocarbon phase — just like sugar and coffee. That was a very interesting observation because if you were to put the catalyst in the fluorous phase and heat the reaction mildly, you could dissolve it into the hydrocarbon phase and then cool it, at which point the mixture would then separate back into two phases. That means that a fluorous biphasic system could provide the best of both worlds: It allows for the mild reaction conditions of a homogeneous system with the ability to later separate the two phases, as in a heterogeneous system. And thus, our longstanding chemistry quandary might be resolved. In 2003, I was part of a research study that tried to develop catalysts for use in the fluorous biphasic systems. The process to study a chemical reaction in a fluorous biphasic system was to select a catalyst you want to study and then modify the catalyst with fluorines so that it became soluble in a fluorinated solvent while keeping your reaction materials non-fluorinated so that they are soluble in the hydrocarbon solvent. Let’s go back to the tea example. Basically, we were trying to make the tea leaves completely mix with the water, but they needed a little coaxing. So we had to chemically modify the tea leaves so that when we were done brewing, they had completely dissolved in the water — no need to toss the teabag. So we fluorinated them. Okay, we didn’t actually fluorinate tea leaves. 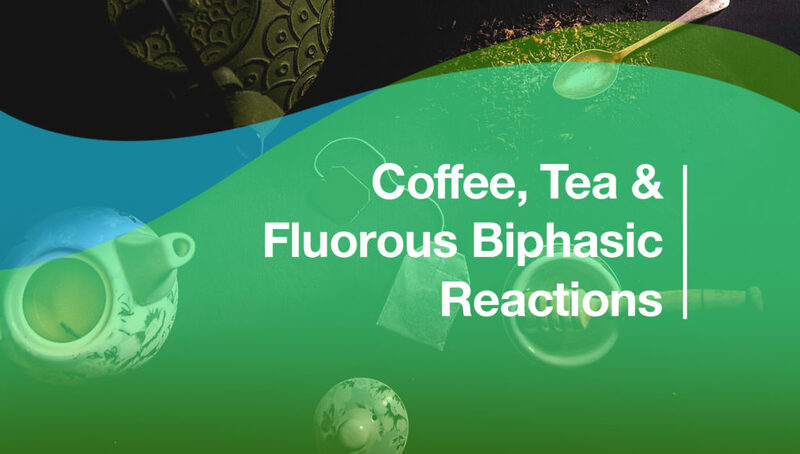 In reality, our tea leaves (catalyst) were actually a derivative of a rhenium(I) bipyridine complex, which we chose because of its known ability to reduce carbon dioxide to carbon monoxide. From an environmental standpoint, it allows us to do synthetic photosynthesis, because we can take carbon dioxide from the atmosphere, which is chemically dead, and reduce it to carbon monoxide, which can then be used to chemically generate a lot of other useful compounds — and possibly, one day, fuel. In our case, our catalyst was made up of two parts: the rhenium(I) metal and a ligand (the part of the catalyst that attaches to the metal). And in order to make our catalyst soluble in a fluorous solvent, we needed to add fluorine atoms to the catalyst — which we did by detaching the ligand from the metal and attaching long fluorine-containing molecules to the ligand. Once that was done, we re-attached the ligand to the metal center (a process called coordination) to recreate our catalyst, which was now soluble in a fluorous solvent. Going back to our tea analogy, we got our tea leaves to dissolve completely in water. That’s interesting because the research suggests that you can fluorinate a ligand that can be used as a catalyst complex that can turn carbon dioxide into carbon monoxide, and that could be done in a fluorous biphasic system, which affords the mild reaction conditions and the high reactivities expected with a homogeneous system. In addition to that, we would have the benefits of separation associated with a heterogeneous catalyst because of the way that the fluorous biphasic system is designed. Now go back to the first paragraph and see if you understand it. If not, feel free to contact me with any questions. And if you want to read more, check out the 2002 paper I co-authored with my research peers.